Stealthy and cloaked in black, our Nightfall Peacekeeper Sword Cane is anything but ordinary. Press the button release and pull open to reveal the 440 stainless steel blade hidden inside! Features include an executive style wooden ball handle and ribbed extended grip, both finished in black, sitting atop the smooth scabbard portion of the shaft. A rubber tip had been added to increase traction against the ground when walking. Measurements: 22 1/4 in. blade, 36 in. overall. Exactly as imagined. Difficult to remove sword until I used a file to file off the metal burs inside, around the release buttons - now works perfect, very cool. I like the cane very much. 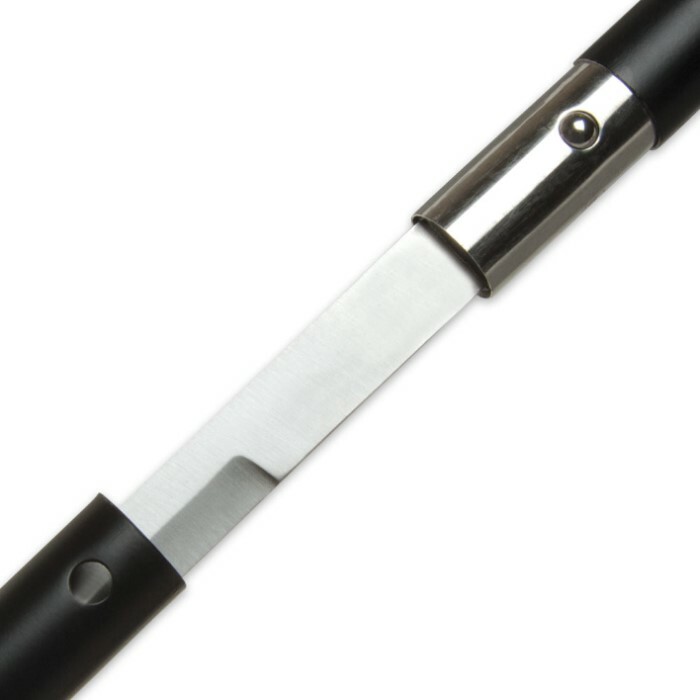 I really use it as a cane and like that there is protection at my finger tips. But, the two release buttons do not work well. I could never release it it a moment of need. It would take a few seconds to accomplish and sometimes that is to long to wait. I liked it overall with the only disappointment being the sheath. The blade just hangs in it bouncing around dulling it. For $20 bucks it is a fairly solid piece of kit, but not nearly perfect. Straight out of the box, the wooden ball on the handle fell off. The blade rattles in the cane, and needs to be sharpened, but it does have a decent "heft" about it. As others have said, a few modifications and this could be an excellent cane. ...True, but every so often you get something thats value meets or exceeds its price. I was pleasantly surprised when I pulled this item from the package. I mean you can scarcely get out of a fast food restaurant these days for less than a $20. I wanted a long blade 22+ inches because let's face it, if I ever pulled this on someone it would be a defensive last resort, and as such. someone is going home missing a hand. and this weapon is sharp and sturdy enough to hack it. Rattled a bit in the sheath but 2mins and a piece of foam rubber, and it was the real deal. Money well spent. I intend to upgrade and I will gladly shop here again. Well done BUDK, and thanks! Just received my Black wood traveler and it surpasses my expectations. The wooden ball appears secure and the blade is surprisingly sharp. Additionally, I received my cane in 6 days!!! Worth much more than priced. Thank you Bud K. Y'all knocked it out of the park!!! I just got cane today and cannot believe how nice it is. Way better than I expected for the price. Like someone posted before, any problems they had in the past have been fixed. I think I'll buy some for Christmas presents. Too bad we live in such a dangerous world. At least this cane gives you a fighting chance. I love it! I read the reviews here, and the three year old ones on BUDK, and I was expecting a DIY cane project. I was pleasantly surprised when I got my cane, the ball was on tightly, the blade was sharp enough that it only took a few passes with a sharpener to get it where I wanted it. The rubber foot so far has stood up to three days of walking. I put some foam rubber in the bottom and the blade doesn't rattle now. I would encourage people to buy this cane now, I think they learned from the bad reviews and made a better product, or better quality control. When I received these items as a bogo, the Pommel came out of both canes, glued them back together. At first test swing against an aloe plant leaf, the ball bearings that hold the blade into the scabbard popped out and the whole blade shot out of its handle onto the ground. Definitely something I feel strongly about defending myself with. I replaced the blade back into the handle and drilled a hole and screwed it in, it wont come out now. However I cant find the ball bearings anywhere. Oh well, for 10 bucks its a do it yourself item, but I still like it.